Let's Get Your Bounce Going! Description: Under Construction is the perfect bounce house for those little builders in your life. 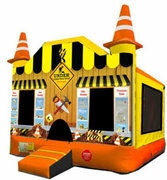 The digital printing is excellent on this bounce house so put your hard hat on and join the crew.